CCI Thermal Technologies Inc. is a leader in heating and filtration solutions. We engineer and manufacture a wide array of heating and filtration products for industrial, commercial and hazardous area applications throughout the world. Our products represent the broadest based industry expertise and the range of our technologies enables their application in any environment. CCI Thermal Technologies Inc. is the result of a merger between eight complementary yet diverse heating & filtration equipment manufacturers: Ciscan Industries Ltd. of Edmonton, Alberta, Canada; Ruffneck Heaters of Calgary, Alberta, Canada; DriQuik Inc. of Greensburg, Indiana, US; Caloritech Inc. of Oakville and Orillia, Ontario, Canada; Wellman Thermal Systems formerly located in Shelbyville, Indiana, US; Flo-Dri Inc. of Sunset Beach, California, US; 3L Filters of Cambridge, Ontario, Canada; and Fastrax® Industries Inc. of Denver, Colorado, US. Cata-Dyne™ from CCI Thermal Technologies Inc. is the industry standard in infrared heaters, gas catalytic heaters, enclosures, pipeline systems and accessories. Norseman™ from CCI Thermal Technologies Inc. is the most technologically advanced line of explosion-proof electric air heaters and heating accessories, including both forced air convection heaters and natural convection heaters, as well as unit heaters, panel heaters and thermostats. Ruffneck™ from CCI Thermal Technologies Inc. is renowned for its rugged, reliable and versatile heavy-duty explosion-proof heaters, heating systems and heating accessories. 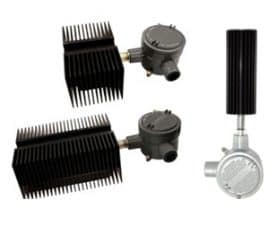 Caloritech™ electric heaters, heating elements and heating accessories are well-known in the industry for their quality, reliability, performance and versatility. In addition to standard “off the shelf” industrial heaters and heating systems components, Caloritech™ also offers engineered heating solutions custom designed, manufactured and tested to satisfy customer specifications. No matter what your application or environment, Caloritech™ has a solution to fit your heating needs.